Transform your unfinished basement into your new favorite room! Remodeling your basement is a great way to increase overall living space without having to add any more rooms to your home. Bannochie Builders will work with you to design the perfect solution for your home. A finished basement can increase the overall value of your home while giving your family more space to enjoy. Finishing or renovating your basement can turn that dingy and scary lower level into a lively space that the whole family will love. 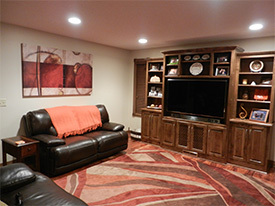 A lot of customers who want their basement finished or remodeled often look at the “negative” aspects as positive ones. For example, lack of light can be great for a home theatre. There are many ways you can turn your basement into a full-functioning room including: an exercise rooms, home offices, playrooms, game rooms, pool parlors, dens and more. Whatever idea works best for you and your family, Bannochie Builders can make anything happen. Two of the main concerns we look at when remodeling or finishing your basement are insulation and waterproofing. Insulation helps regulate the temperature in your basement living space and also prevents unwanted condensation–which can lead to mold and mildew. Our professional team of experts will provide you with a full assessment of your basement insulation to help maximize the efficiency and comfort of your new living space. Waterproofing requires a detailed process that assesses your entire basement foundation and repairs any problems that are detected. Water leakage is something that you never want in a basement, especially in one that you have spent time and money making stunning and livable. If you are ready to change your basement into a fabulous new game room or home theatre, call our office today!